Bushnell are one of the few manufacturers still producing high quality porro-prism binoculars. Manufactured with BaK-4 prisms to give a bright, clear, crisp image. The optics are Fully multi-coated optic for improved light transmission and brightness. The textured centre-focus knob allows for easy, precise adjustments, even with cold hands. The twist-up/twist-down eyecups allow full field of vision even when used with spectacles. 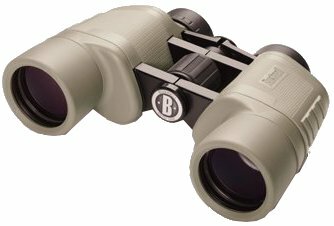 This 8x42 model has an exceptionally wide field of view, allowing easy tracking of moving items or quick targeting of stationary objects, making them ideal for viewing nature and bird watching. Tan coloured rubber armoured, supplied with a case, strap and a manufacturers guarantee.